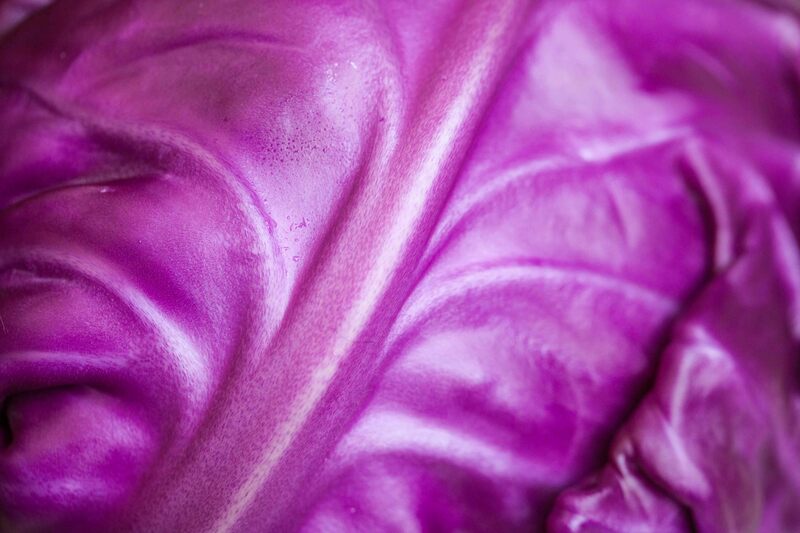 I recently discovered another readily available & cheap veggie in Buenos Aires: cabbage. For some reason I was always a bit scared of cabbage. I’m not sure why. I think it’s because it’s big & heavy and I never really knew what to do with it. However, I recently learned about its health benefits in my Pathology course (the study of diseases), and my fear went away. I bought a nice big purple cabbage and made a healthy, easy, yummy coleslaw. 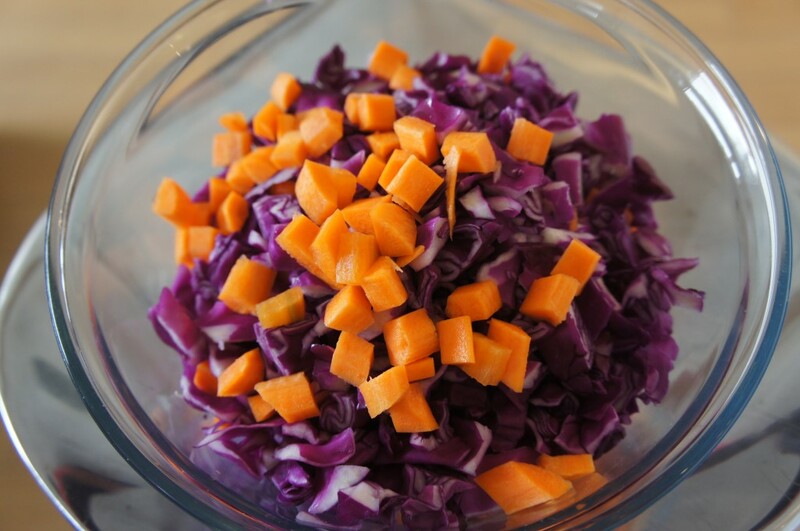 Raw cabbage is sweet & crunchy and a great way to switch it up from your regular old salad. Once again, you have to learn about its health benefits before I give you the recipe. 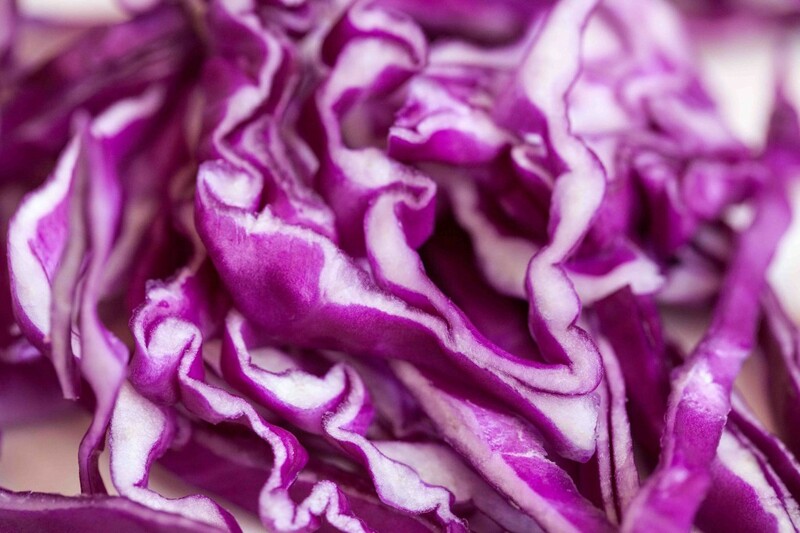 Raw cabbage is best (cooking removes its nutritional value), but fermented cabbage or sauerkraut* is also very good for you. Sauerkraut is a fermented food and works the same as pro-biotics by adding healthy bacteria to your intestines. An abundance of healthy bacteria in your gut is key for proper digestion, which helps prevent disease by preventing a build-up of toxins in your blood & organs. Preventing toxic build-up also makes your skin & hair look better, gives you more energy, prevents bad breath, and overall keeps your body humming along the way it should. *Try and find a brand that doesn’t include vinegar. Vinegar is a preservative, which decreases the health benefits. 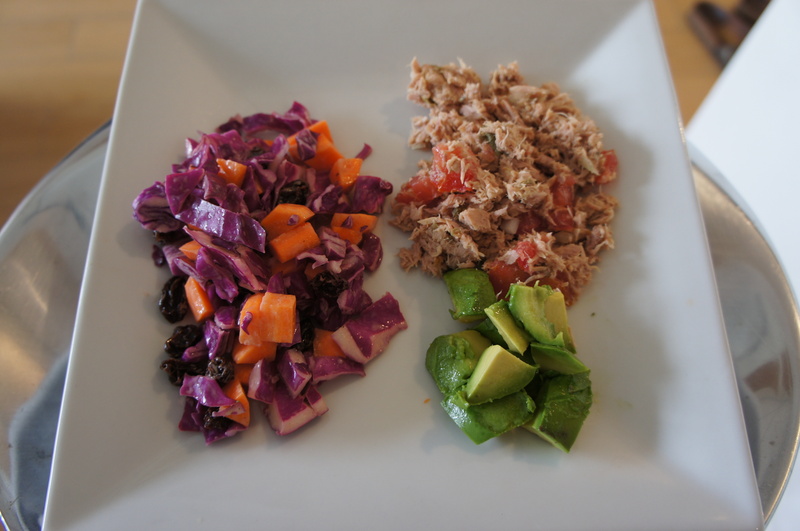 And like I promised…here’s the coleslaw recipe – enjoy! 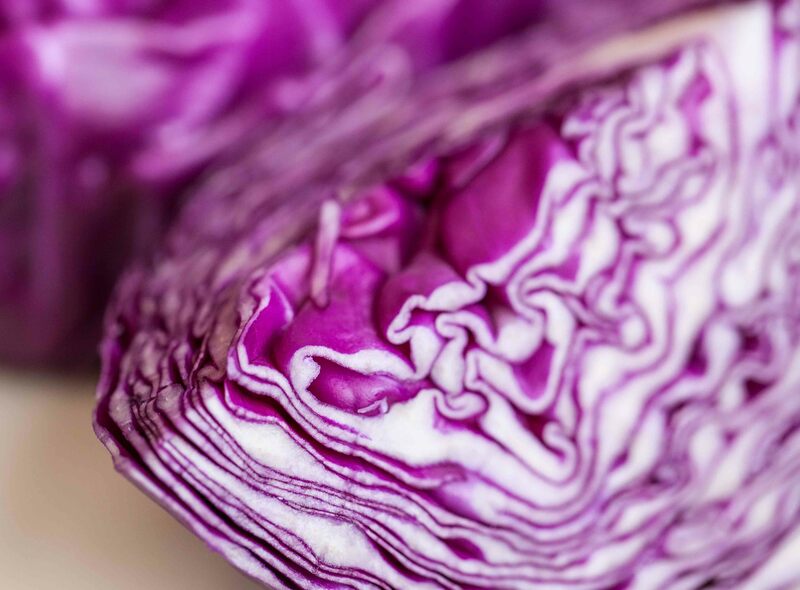 Cut the cabbage in half (store the other half in the fridge for your next batch – you’ll want to make it again), and rough chop it into bite-size pieces (you can also shred it using a mandolin). In a small bowl, whisk together the Greek yogurt, vinegar & honey until you have a thin, dressing-like consistency (give it a try and add more yogurt or vinegar depending on your taste). 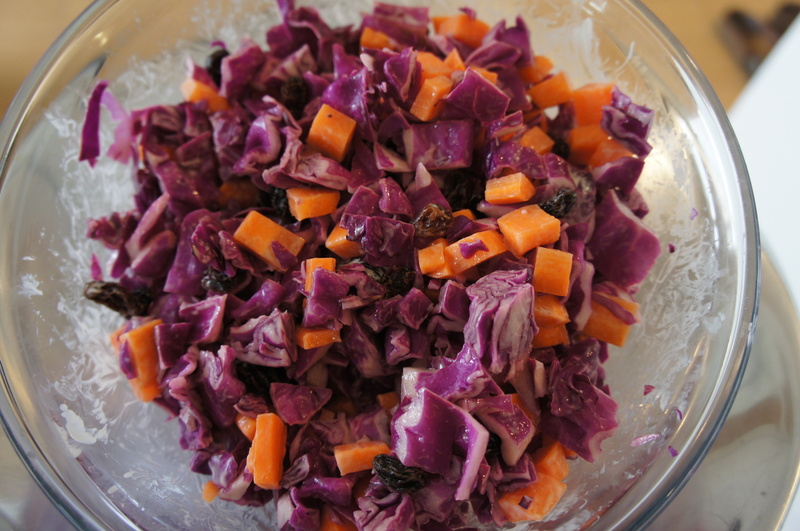 In a large bowl combine the chopped cabbage, carrots & raisins. Stir in the dressing, season with salt & pepper and voila! I had it for lunch yesterday with tuna & avocado, and today with a boiled egg, and it was a nice change from some of the other veggies that I’m getting a little sick of here in Buenos Aires (I’m talking to you tomatoes & red peppers). I made this for my family last night and they loved it!! Definitely going to be incorporating some cabbage into my diet more 🙂 thanks for sharing! That’s great to hear Sarah! It’s a nice change from salad, and SO good for you!